Ever since I did the 50s Housewife Experiment, I've been striving to make healthier and more conscious food choices. After having eaten the 1950s way for two weeks, I keep envisioning all the gelatin, canned vegetables and flour-drenched meat still globbing onto my colon like a bunch of skeevy remoras. When my father-in-law passed away, all healthy intentions went out the door for a couple weeks and we lived off the goodness of others who brought trays of food over to my mother-in-law's house. People were so kind and generous that nearly every surface of the home had food on it. As my brother-in-law cleverly observed, "nothing says 'sorry for your loss' like little triangle sandwiches and cubes of cheese." Anyway, when people pour their hearts into food for you during a difficult time like that, you don't stop and ask them if they know if the ham in those sandwiches were factory-farmed or if they could make that lasagna in a vegetarian version next time. No, you don't say that unless you're a sack of crap. Instead, you are so grateful and awed by their kindness that you take their gifts with wholehearted appreciation. But we've been back home for a while and it's high time that we return to healthful, whole eating. I've been pretty good this week, but today is officially (or maybe not "officially", I have no idea. Do hippies ever fill in the paperwork to make things official?) Green Smoothie Day. The concept is simple: Take some fruit, take some leafy greens, add a bit of water and blend. Add in extras to suit your taste. The result is a tasty and all-natural fibre, vitamin, mineral and water-rich drink that can easily replace one of your meals. You'll feel better, get loads of veg and fruit for a meal and maybe even drop a pound or two if you drink them consistently. 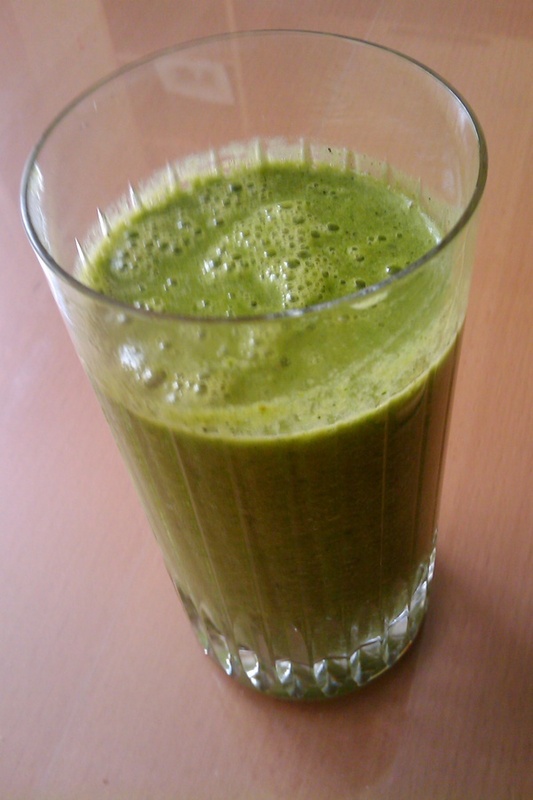 I've decided to join the BiG Green Smoothie 10-day Challenge and make smoothies a part of my day during that time. You can obviously just do it and not pay, but I'm kicking in $10 to the cause as all the money goes to help a cute girl's club in NY. Yay for being good at such an affordable rate. It's really yummy. I swear. Yes, it smells a touch 'green' (not quite like grass, not quite like a salad) but it tastes like tasty, tasty fruit. When I drink green smoothies, my poops are truly epic. If it wasn't for a fear that this site would get flooded by people who have certain fetishes, I would totally post a picture of one of my green toilet babies for you all to admire. Even if you're not the type who is impressed with a good poop (my god, what DOES please you? ), these would captivate you for at least, like, five seconds before you turned away and pretended to be disgusted. It's like that scene in Contact when Jodi Foster lands on the other planet and whispers in awe, "they should have sent ... a poet." Yah, that. These poops are muses. And - that - my friends, is my pitch for you to try a green smoothie. Amazing that the marketing agency I was with let me walk away, right? I think I'll just take your word on it. Haha. SOLD! LoL. I do think I'll give this a try.